One of my favourite cities on the planet (and number 2 on my top ten list of global vegan cities) is the incomparable New York City. NYC is like no place else. I am gearing up for a brief return next month and I need your help. Please hit the comments section to let me know your top tips for being a happy vegan in New York. I will of course be dining out at my favourites Red Bamboo and Cinnamon Snail, but I need some new experiences of the plant-based variety during my Big Apple stay. Blossom on Carmine (43 Carmine Street) – bloomin’ fabulous! Fir a quick bite, Terri on 23rd and 7th is great! You MUST find the cinnamon snail truck! They are amazing! I didn’t like Dirt Candy, because the vegan options are just the veggie options minus cheese and I hate that! Also, the one lucky duck place that does raw food. So amazing! Yes, I already love Cinnamon Snail. One of the finest vegan food businesses on the planet! That donut on this blog post is from them. Candle Cafe, Pure Food and Wine, HanGawi (they specify vegetarian, but they may be vegan), Franchia is HanGawi’s sister restaurant, and is vegan. Beyond Sushi is amazing. All vegan Sushi! Abd amazing desserts too! They have a couple of branches. I went to the one near the MoMA. Lula’s in the East Village for ice cream. Pickle Shack in Brooklyn – vegetarian but they do a few amazing vegan sandwiches, and desserts. Roberta’s Pizza – not vegan or veggie but has vegan options that are delicious. Also just round the corner is vegan bar Pine Box Rock Shop. Paulie Gee’s – great pizza, vegan options. Have to echo others – Champs, Beyond Sushi and Dunwell Doughnuts are all FANTASTIC. If you go to one place it has to be one of these. Lula’s is now Blythe Ann’s (owners divorced). Lula’s had amazing cashew based ice cream, best ever. I belive Blythe Ann’s is the same but might be closed thus time if year. Red Bamboo is a firm favourite for me too, as is the Cinnamon Snail. I was so gutted they were off the road last time I was there. I love all the Blossoms and Candles and could happily rotate between them for the rest of my life, if only we had something like this here in London. But if I could only eat at one I would pick ‘Blossom’ on 9th or ‘Candle 79’ . . . I’d have to flip a coin! Atlas Cafe on 2nd of course for the most amazing cake and filled doughnuts (delivered on a Tuesday so go late Tuesday or Wednesday if you can). I’m not a huge fan of raw food but ‘Pure Food & Wine’ do it really well and unlike at most raw places you can drink alcohol! ‘Peacefood Cafe’ is quite good and hasn’t been mentioned (two locations). I love ‘Lan’s Cafe’ as although the place is very basic the food is great and also cheap. I was completely unimpressed with M.O.B. and I wouldn’t bother with TeaNY now it has changed hands. I’ve read some impressive reviews of the rather pricey Kajitsu. I hope to go there when I go in the spring so I think you should go and review it for me! They say Brooklyn is now the place to be as prices are forcing businesses out of Manhattan. A lot of great places were already listed. Glad to see you already have the snail and red bamboo on the list. Lula’s (which is no longer called Lula’s, but is still in the same place and still amazing) is the other absolute must. I put it on par with the cinnamon snail (except it’s just ice cream). I’ll also second Peacefood cafe. Definitely great for comforting food, but not exactly the most innovative, except when it comes to pastries. As far as I know we had the first vegan croissant doughnut (Kristin started making them right after the originals debuted). There are also a variety of amazing regular croissant flavors on the weekend (including ham and cheese!) Organic grill was mentioned, even though it’s not vegan, one of my favorite brunch places, especially when I’m with non vegan friends. My newest favorite is Seasoned Vegan, up on 113th street. I went with non vegan friends for the first time a few weeks ago and we were all blown away by the food. I especially recommend the po boy. If you’re looking for recommendations for specific neighborhoods, I can also provide those! Thanks! Yes, Seasoned Vegan has been on my list ever since they followed me two weeks ago. I had never heard of them before that. Thanks for all the tips. Buddha Bodai in Chinatown if you love fake meat. The appetizer platter is amazing and I bet their dim sum is off the hook. Also, if you don’t have Chao Cheese by Field Roast in England, buy some at Whole Foods to take home. Oh, and Uptown Juice Bar in Harlem. Serve yourself hot bar, pay by the pound, great to take back to your hotel for a feast. I haven’t been to Uptown Juice Bar in years. I’m glad to hear it is still there. Don’t forget to check out the Dr Cow cheese shop in Williamsburg too! Kajitsu.. and don’t forget to try the pumpkin croquettes! 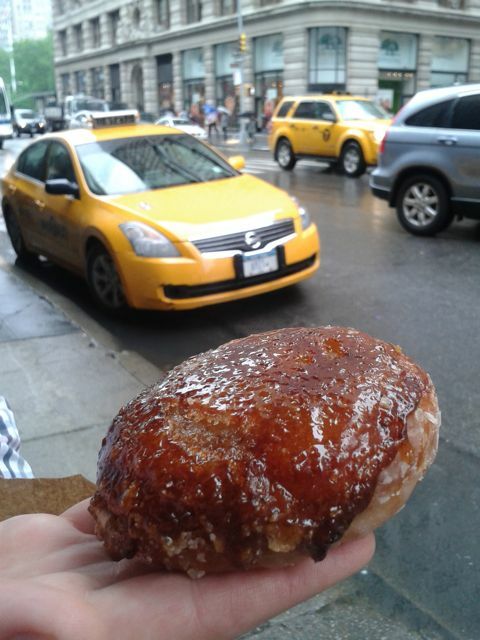 As have others, I highly recommend Dun-well Doughnuts in Brooklyn. I’ve only ever had the panini at Peace Foods, but it is scrumptious. I find Vegusto much better than what I purchased at Dr. Cow. Also TeaNY was pretty dismal when I was there last year. If your U.S. trip includes Boston, let me know, as that’s where I am and can make plenty of suggestions. Bon voyage! Thanks, Jo. I love Dun-Well so if the weather permits, I will be back there for sure. Also would recommend budda bodai, the bbq meat is great! Taro bowl and salt and pepper ribs are also pretty great (though the ribs are nothing like real ribs, but grea tin their own way), the dim sum isn’t all day, only till 2:30 or 3:30pm,if you’re interested in that. Champs diner (it gets quite busy at weekend brunch, so if you can go on a weekday might be better) have pretty awesome country fried seitan sandwich & grinder is also great!